LOVE IT - OR HATE IT?? Don't be afraid to tell us what you really think about these products - it's just a game! We really do want to hear your thoughts - good - or bad! Do you love it - or - hate it? Enjoy your summer days in the sun with this chic assortment of accessories that are as functional as they are fashionable. Canvas and straw beach totes are perfect for toting magazines, an iPod and that new steamy novel. Lightweight scarves that double as beach cover-ups. Floppy sun hats that protect your hair and skin from the sun’s rays. Just add sunscreen and you’re all set. The details: Labels include Kelsey Dagger, C’N’C CoSTUME NATIONAL, Surface to Air and more. If you love Beach Totes, did you know you can find them on Ebay? 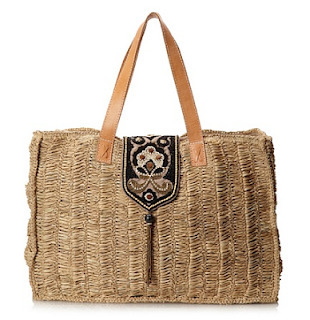 If you love Beach Tote Bags, did you know you can find them on Ebay?